Back in November, Google updated its new design guidelines for the first time, adding guidance on the navigation drawer and launcher icons, and - happily - a "what's new" section, which it said would serve as a place to explain future updates to the guidelines. Yesterday, Google gave the guidelines another sizable update, adding an entire section to guide devs and designers on when and how to use floating action buttons, along with new guidelines for data tables, overall app structure, and guidance on important units and measurements, plus a lot more. Here's Google's full list of changes. Where Google's last update to the guidelines seemed to be about filling holes, this update is positioned as a response to the community, giving more specific guidance on things that seem to have arisen as points of interest in material design. 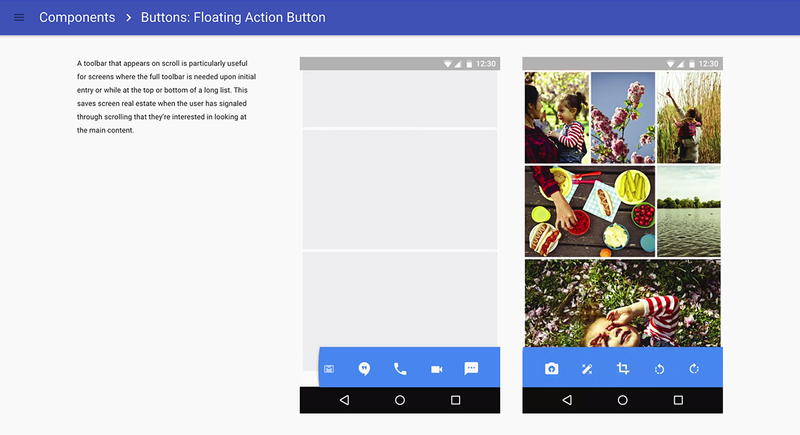 The FAB or floating action button, for example, has undoubtedly emerged as one of the most attention-grabbing elements of material design. In this update, Google has paid special attention to the button, further clarifying when to use it, and what it should be able to do. A couple of new patterns have even been defined for performing quick actions with the FAB, and Google has new recommendations for the speed dial as well. Elsewhere Google answers more questions about general app structure including advice on when to use certain navigation structures and how to make your app's start screen rewarding to users both new and frequent. To see all the new changes, you can hit any of the links in the change log above, or check out the original post from Google Design linked below.